Author, CNN political contributor, and environmental and human rights activist Van Jones will take the stage on Monday, September 12th to discuss the Green Economy and its relationship to criminal justice reform and racial equity. Jones will examine connections between current social issues and environmental issues, with a focus on St. Louis’ unique challenges of weak environmental policy, high incarceration and recidivism rates, and a small but growing green jobs sector. Commentary will include critiques of current presidential candidates’ environmental policies. Van Jones is a Yale-educated attorney, and author of two New York Times best-selling books, The Green Collar Economy (2008) and Rebuild the Dream (2012). Jones has founded and led numerous social enterprises engaged in social and environmental justice, including The Ella Baker Center for Human Rights, which promotes criminal justice reform; Color of Change, which works for racial fairness through its one million members; Rebuild The Dream, a 21st Century “think tank” that champions innovative solutions to fix the U.S. economy and uplift the next generation; and The Dream Corps, which promotes innovative policy solutions. He was the main advocate for the Green Jobs Act, the first piece of federal legislation to codify the term “green jobs,” and he worked as the green jobs advisor to President Barack Obama in 2009, leading the inter-agency process that oversaw the multi-billion dollar investment in skills training and jobs development within the environmental and green energy sectors. Van Jones is currently a CNN political contributor, and a fellow at the MIT Media Lab. Parking is available in the Danforth University Garage, off of Forsyth Blvd for $1/hour (cash or credit card). Click here for parking details. Join USGBC-Missouri Gateway Chapter for a full-day Continuing Education Blitz exploring energy in buildings, and earn 7 continuing education units for LEED or AIA professional credentials. From global to building specific, educational content will examine energy policies, usage, systems, and financing. 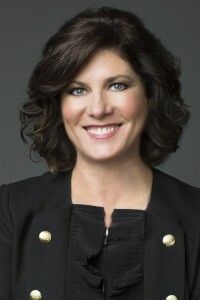 Rhonda Hamm-Niebruegge has been the Director of Lambert-St. Louis International Airport since January 2010. The Airport is the recent recipient of the Governor’s Leader in Energy Award, an award recognizing significant strides the organization has made in the field of energy for Missouri. Rhonda will speak about the Airport’s efforts to develop and implement innovative long-term programs to achieve targeted sustainability goals. Fee includes continental breakfast & lunch. We are excited to share our 2015 Annual Report with you! Each year, the USGBC-Missouri Gateway Chapter makes progress towards our goal of transforming the built environment. 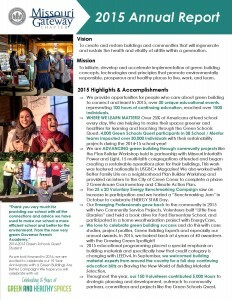 2015 was no exception, as we continued to provide high quality educational events, celebrated another successful Green Schools Quest, expanded our community offerings, and much more! We provide opportunities for people who care about green building to connect and learn! In 2015, over 30 unique educational events, representing 100 hours of continuing education, reached over 1500 individuals. WHERE WE LEARN MATTERS! Over 25% of Americans attend school every day. We are helping to make their spaces greener and healthier for learning and teaching through the Green Schools Quest. 4,000 Green Schools Quest participants in 38 School / Mentor teams impacted over 30,000 individuals with their sustainability projects during the 2014-15 school year! We are ADVANCING green building through community projects like the Plan Builder Workshop held in partnership with Missouri Interfaith Power and Light. 15 multi-faith congregations attended and began creating a sustainable operations plan for their buildings. This work was featured nationally in USGBC+ Magazine! We also worked with Better Family Life on a neighborhood Plan Builder Workshop and provided an intern to the City of Creve Coeur to complete a phase 2 Greenhouse Gas inventory and Climate Action Plan. The 25 x 20 Voluntary Energy Benchmarking Campaign saw an increase in participation and we hosted a “Benchmarking Jam” in October to celebrate ENERGY STAR Day. Our Emerging Professionals gave back to the community in 2015 with two Community Service Projects. Volunteers built “Little Free Libraries” and held a book drive for Ford Elementary School, and participated in a home weatherization project with EnergyCare. We love to celebrate green building success and do this with case studies, project profiles, Green Building Experts and especially our annual awards. In 2015, we looked back at 6 years of 40 awardees with the Growing Green Spotlight! 2015 educational programming placed a special emphasis on building materials and specifically how that credit category is changing with LEEDv4. In September, we welcomed building material experts from around the country for a full day continuing education blitz on Braving the New World of Building Material Selection. Throughout the year, our 150 Volunteers contributed 5,000 Hours to strategic planning and development, outreach to community partners, committees and projects like the Green Schools Quest. Many thanks to the leaders, committees, volunteers, members, sponsors and donors for making 2015 a success! You can view the report as an online magazine below, or download a pdf. USGBC’s Center for Green Schools has opened the call for applicants for the 2016-2017 School District Scholarship. Travel, lodging and attendance at the Green Schools Conference and the pre-conference summit for School Sustainability Leaders. Travel, lodging and attendance at the Greenbuild International Conference and Expo. $3,000 grant to assist in implementing a high-impact sustainability project. Ongoing training through personal and small group coaching. Limited complimentary year-long access to several school resources from USGBC, including Learning Lab, the Green Classroom Professional Certificate, and LEED Coach for school projects. Applications are due August 19th. Click here to learn more and apply!